Need something to help organize your travel necessities of your car, pick up truck or SUV? The Lebogner Auto BackSeat/Trunk Organizer is the answer!!! Keep your all your travel necessities in your car neat and organized by storing everything you need in this premium quality backseat/trunk organizer. Magnificently designed to suit the needs of every driver, the LEBOGNER Backseat/Trunk Organizer offers more space for carrying more items for you. ★ Customized design fits the back seat or in the trunk of Most Vehicles. Measuring 41.5” x 12” (106cm x 31cm). ★ They fasten to the back of your seat with two attachment points at the top for a secure fit. ★ 5 Spacious Pockets, A Roomy Center Mesh Pocket Measuring 23” To Keep Bulky Products, 2 Side Mesh Pockets Measuring 9” To Keep Larger Items, And 2 Gusseted Pockets In The Center To Keep Smaller Items. ★ Great design that will suit any car interior and can be used for both kids and adults. ★ Backseat/Trunk Organizer install in 30 seconds. Hurry! Keep Your Car More Organized And Cleaner And Make Your Life More Easier By Adding This Amazing Lebogner BackSeat/Trunk Organizer To Your Cart Today! 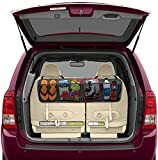 ✓ ★ A MUST HAVE ★ This BACKSEAT/TRUNK ORGANIZER Is Constructed Out Of Heavy Duty Material And Perfect For Cars, Vans, SUV, And Trucks. With It’s Premium Quality It Is Long Lasting, Strong, Durable, Good Looking And Will Have A Snug Fit. ✓ The BackSeat/Trunk Organizer Is Designed To Provide The Most Storage Space Possible. It Has 5 Spacious Pockets, A Roomy Center Mesh Pocket Measuring 23″ To Keep Bulky Products, 2 Side Mesh Pockets Measuring 9″ To Keep Larger Items, And 2 Gusseted Pockets In The Center To Keep Smaller Items. ✓ You Can Store Sports Gear, Dog Supplies, Tools, Toys, And Emergency Equipment In The Organizer. It Will Keep The BackSeat Or Trunk Of Your Car Clutter Free. When Not In Use The Organizer Will Fold Flat For Easy Storage. ✓ The BackSeat/Trunk Organizer Is Measuring 41.5″ x 12″ (106cm x 31cm). It’s Designed To Fit Most Vehicles With The Two Top Adjustable Straps For The Headrest Posts, So It Will Be Simple And Easy To Install On The Front Seat For Organizing Your Car, Or On The Back Seat For Organizing Your Trunk. ✓ Buy It Now With Confidence, This Best ★ TOP QUALITY AUTO BACKSEAT ORGANIZER ★ Will Keep Your Seats Clean 100% and We Guarantee Satisfaction With a 100% Lifetime Money Back Guarantee.
? Customized design fits the back seat or in the trunk of Most Vehicles. Measuring 41.5″ x 12″ (106cm x 31cm).
? They fasten to the back of your seat with two attachment points at the top for a secure fit.
? Deep and sturdy pockets to ensure items do not fall out while driving.
? 5 Spacious Pockets, A Roomy Center Mesh Pocket Measuring 23″ To Keep Bulky Products, 2 Side Mesh Pockets Measuring 9″ To Keep Larger Items, And 2 Gusseted Pockets In The Center To Keep Smaller Items.
? Great design that will suit any car interior and can be used for both kids and adults.
? Backseat/Trunk Organizer install in 30 seconds.